Think crisp fresh air, very dark sky and then these tiny tiny small white lights far far up there! This soap bar is a wonderful facial soap and a great all over body bar. With a forest view and an urban heart beat we blend this all natural and vegan soap in our workshop. We make our soaps in very small batches. We feel that by doing this, we are more aware and in control of each batch and how it turns out. Each of our scents are unique and created by us. We spend many hours combining pure organic essential oils to come up with the perfect scent. Almond oil, Palm oil, Glycerin, Coconut oil, Olive oil, Distilled water, Sodium Hydroxide, activated charcoal (food grade) and notes from carefully chosen essential oils. The scent is calming and at the same time laden with energy. 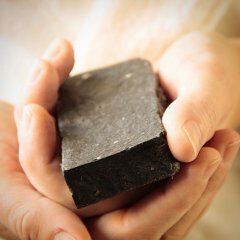 Activated charcoal draws impurities and toxins out of the skin and leaves it fresh and clean. This soap bar is therefore also great for teenage troubled skin. 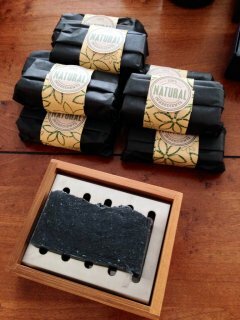 Remember to keep your natural soap dry between uses for it to last longer.